I have a little wicker chair that I bought for when Georgie, my granddaughter, comes to visit! 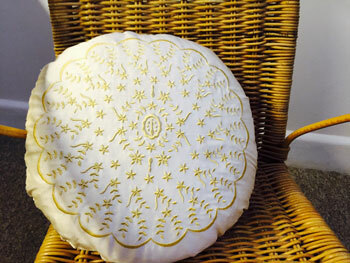 It does need a cushion though, and while I was finishing off the Georgiana collection which is named after her I thought I would use one of the designs to create the perfect little cushion. There are two circular designs in this final set for 12″ by 8″ hoops, but I choose the first one for this project. 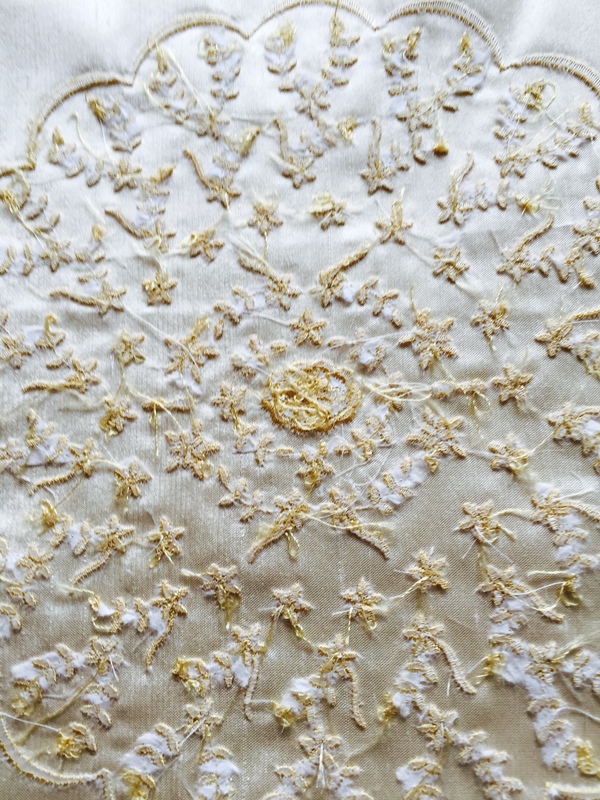 I found some beautiful cream silk and embroidered the design out in gold (Sulky Rayon 40 wt 1070) which is one of my favourite colours in the whole range. 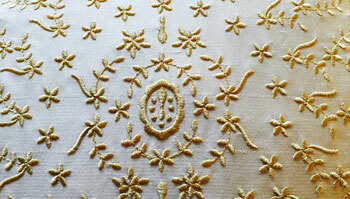 It reminds me of the seven embroidered waistcoats I made many over ten years ago for one of my daughters weddings. She choose this thread colour and we matched it up with some silk for the bridesmaids dresses. Back to my cushion….. I had envisaged a little round cushion but was unable to find one so it looks like I may have to change my plans. A huge 18″ round cushion on the little wicker seat would leave no room for Georgie! I can either create one myself or use a square one. Now a different shape would mean I could add a border or a few more designs, maybe some buttons…! NO! This was meant to be a little simple cushion, so I will improvise and create my own cushion pad as there do not seem to be many small ones out there. After the embroidery was complete I removed most of the stitch and tear, even though this is quite a dense design. Leaving too much stabiliser on the back of a design can be the reason for puckering. A good press on the back finished it off nicely. 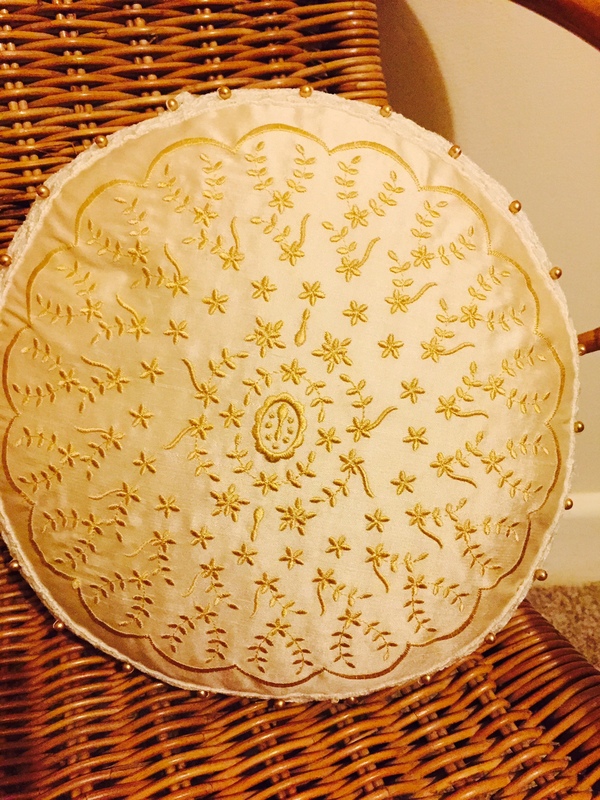 To make a circle on some cream curtain lining for my cushion pad I used a dinner plate drawing around it so I could cut a perfect circle. I stitch the two pieces together, left a hole for my feathers, and turned it the right way out! Selecting a very big bag I placed an old large cushion I was going to unpick and my pad inside transferring enough feathers over to get a nice soft cushion. Then I stitched the hole closed. It was just the right size. 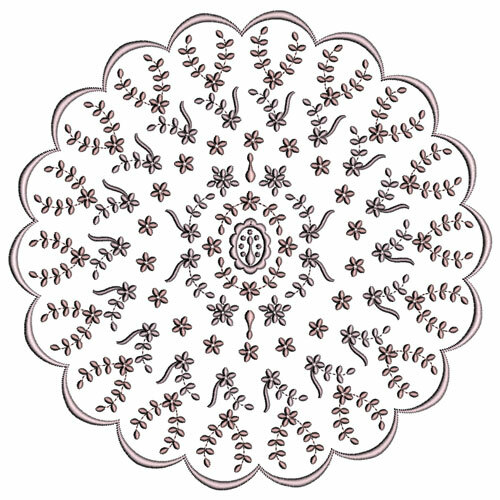 I then made a circle with the same dinner plate on some cream silk and cut it out. This was then centred over the design and I sewed about two third of the seam, so I could ease the cushion pad inside it. Then I closed that opening with hand stitches. However I was not altogether happy with the finished cushion. It needed something else! Pearls and lace! On one of my many visits to Nottingham, England where my sewing machine dealer is based I purchased some very special Nottingham lace. This is very easy to recognise as it is created on tulle and is very delicate. 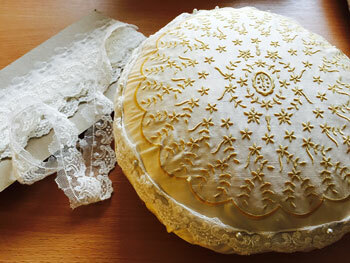 Hand sewing some of this lace around the cushion would set the embroidery off and I added a few gold pearls too! 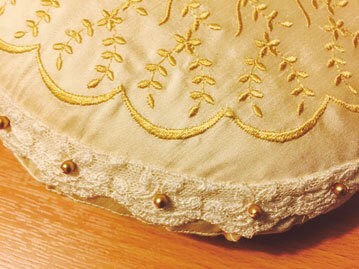 Here is my finished cushion with the golden pearls and lace! Hope Georgie loves it! The Georgiana collection contains 6 sets of designs including a set of fonts in three sizes, designs with scalloped edges and some lovely triple crosses. I have also added a bonus design of a bib into this final set which will be released tomorrow, March 7th, 2015. Although displayed in one colour each design in the collection is divided up into various segments so you can eliminate sections easily or add several soft colours. This entry was posted in Embroidery projects, New Designs. Bookmark the permalink. It’s gorgeous Hazel! Your granddaughter is a very lucky little girl. Lucky granddaughter! This is beautiful.